Now that I am settled into my new home - that I moved into back in October - I wanted to share my design wins and hurdles from my biggest project to date! Pistachio offers all of the design and styling services featured below. I’d love to work with you on your next project! This serves as the central focal point for my main living space. The colors featured in the art act as a reference point for the rest of the decor. Pro Tip - Consider what you want your central piece to be and build your layout design around it (doesn’t necessarily need to be the largest item!). This was my biggest challenge for the apartment and I’m beyond thrilled with how it turned out. I used plantation shutters to make a faux wall - creating a clear division of the bedroom from the living room. 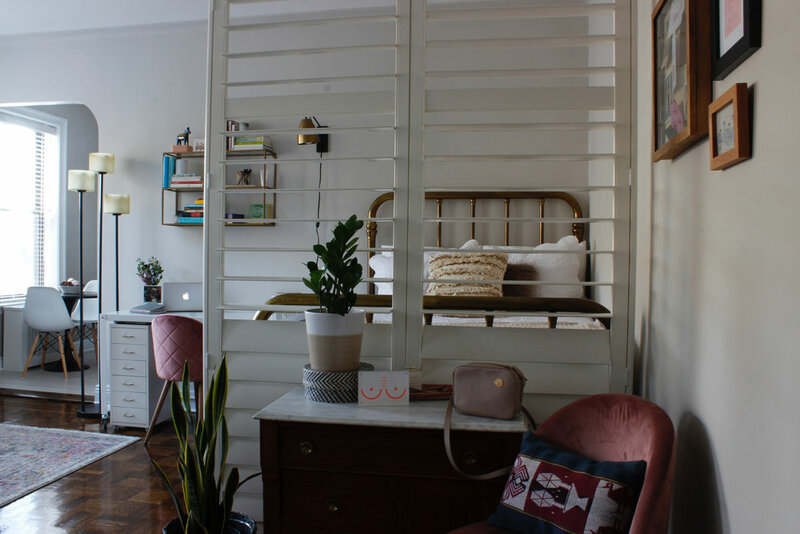 By using floor-to-ceiling shutters the space is clearly separated, but also allows light to come through upon entering the apartment - a similar effect to using a bookshelf or bureau as a divider. The addition of the plantation shutters created an entirely new space that I didn’t have before: a foyer. I added a vintage marble-topped commode as a perfect place for dropping my keys when I get home. It is styled to reflect my personality, bringing a sense of my aesthetic to all new visitors. About a month ago I finished working on a fun gallery wall project (I know, I promise I have more current projects to report on soon!). 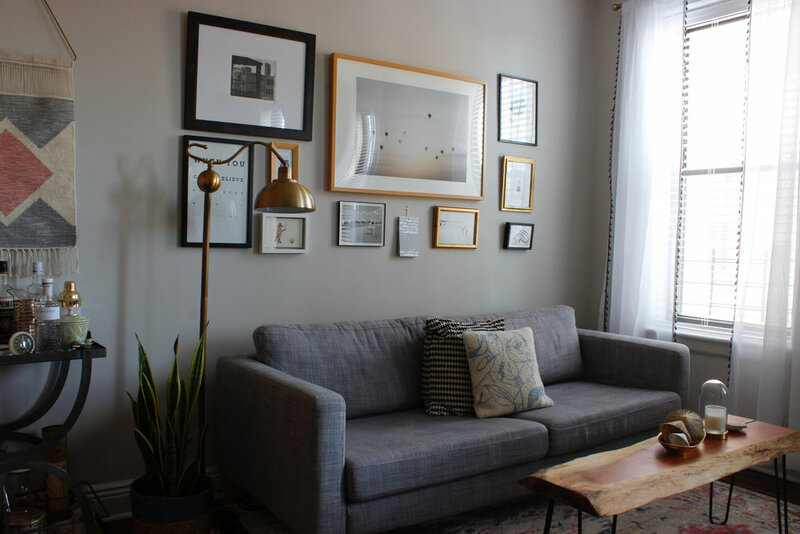 My friend Erin wanted to fill up a bare focal wall in her Upper East Side apartment. Working with the theme of ‘Nautical Americana’, I combined a mixture of art prints, photographs, a vintage map, and postcard with simple, neutral colored frames. We stuck to using mainly 11x17 and 8x10 prints, and worked to find a balanced of scale and texture with the images we chose. Erin wanted the wall to feel full, but also have space to grow her collection, so we followed a loose grid layout that allows for expansion of new prints as she discovers pieces to add. We also added the small hanging ceramic fish as a fun, non-traditional element to the wall. On the hunt now for some antique sailing flags! Below are some installation pictures (it’s so much easier to install a gallery wall with two people rather than one!) and the prints that are still available to purchase.